We regretfully announce that this year's River of Life Retreat has been cancelled. Please check back for more details. We're proud to bring you River of Life 2008. Our purpose is to promote life, healing, rejuvenation, and peacemaking through music. Any skill level (or none! ), any instrument, listeners, singers--and ESPECIALLY any of you who were told in 4th grade, "don't you sing--just mouth the words." I shamelessly admit that part of my mission with River of Life is to use music to bring more love into the world. May be schmaltzy, but true. I am a Roman Catholic theologian who began to use harp with dying patients in the 1980's when I learned that music really did transcend language, even for an elderly Chinese lady in the Palliative Care unit at the hospital in Toronto, whose granddaughter ran out to tell me, "My grandmother can't speak any English--but she asked me to tell you--your music is making her feel better." GOOD NEWS FOR MUSICIANS OF ALL KINDS!! RIVER OF LIFE HARP RETREAT AND MUSICFEST RETURNS to St. Augustine, FL!! WHEN: 3 pm Friday, June 27 - 2 pm Sunday, June 29, 2008. Another celebration of our gratitude for music and spirit! 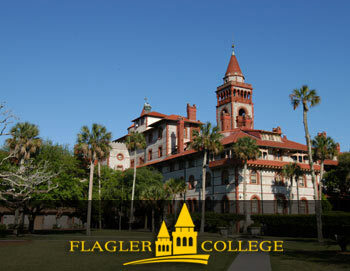 WE'RE PROUD TO ANNOUNCE that we've moved to the beautiful campus of Flagler College, nestled in the heart of historic St. Augustine. It was built in the 1880's by Henry Flagler as a luxurious hotel for vacationing New Yorkers, and is an impressively restored example of "Gilded Age" architecture. 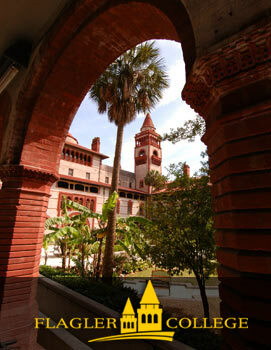 Students will not be in residence, so all retreatants will have use of the libraries, computer services, swimming pool, tennis courts, and charming gardens in the midst of the historic district of The Oldest City. NEW THIS YEAR: A huge performance space (Hurray, extra elbow room for harpists, cellists, and people bringing more than one instrument! ), plus lots of other large and small spaces for our music, prayer, and meeting-and-greeting. -- First Night Gourmet Dinner in the exquisite Flagler Dining Room, which features the world's largest collection of Tiffany windows--you have to see this room to believe it! -- Garden Courtyard reception for "meet and greet"
-- Workshops by our favorite returning artists, Ken Anoff, Percussion; Nancy Bick Clark, Celtic Spirituality and Music; and Retreat Director Diane Schneider on Healing Music. 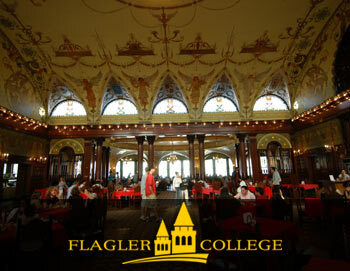 -- NEW THIS YEAR, economical packages including lodging in Flagler College's new Cedar House residence... or if you prefer more luxurious accommodations, lovely bed-&-breakfasts and oceanfront hotels are available. This is still the most unique music retreat out there...because we welcome ALL instruments (esp. harps, flutes, guitars, drums, singers) and ALL skill levels and ages 12 and over. PHONE 904-829-1542 for more details. Space is limited, so it's first-come... and so on! AFTER YOU REGISTER, you will receive a bulging packet of restaurant, lodging, and fun and historic tourist information to prepare for your weekend in the heart of the Nation's Oldest City. IF YOU PREFER a quieter retreat weekend... Your time will be your own, so choose more free time and attend only the sessions you wish. NANCY BICK CLARK, Celtic Harpist/Vocalist, Teacher -- "Celtic Spirituality and Music" for harps and all instruments... featuring a beginner's circle and ensemble training. See below for a link to more information about Nancy. KEN ANOFF, World Music Percussionist, Teacher -- "Time to Drum". Ken brings drums from all over the world for everyone to try... A standout event last year, so don't miss it. JOANNE MUMLEY, Occupational Therapist/Massage Therapist, Chaplain -- with a fascinating talk on The Musician's Body. (We congratulate Dr. Jodi Lowe who has been named a director at the University of St. Augustine, but because of this we regret she will not be able to present at this year's retreat). DR. DIANE SCHNEIDER, Theologian/Vibration Medicine Specialist and Harpist -- on "Drawing Healing from our Spirituality and Music-making." * Special Tour of the lush grounds and Mission of Nombre de Dios and Our Lady of LaLeche--the site of the 1565 founding of Christianity in the "New World"
* TWO chances to perform church music together on Sunday morning--this was a much-loved highlight last year. * Learn to Busk at the "Mullet Beach Gallery" and in the Uptown Antiques District--last year Kathy Pearce's group even collected $28 in tips! A fun and spirited time of jamming and singing for the tourists. Want to hear what previous River of Lifers say? CLICK HERE! JOIN US THIS YEAR! CALL Diane Schneider with questions, 904-829-1542, or Email Diane for prices and registration information.